THE RECIPIENT OF THE 2015 RTSA RAIL SCHOLARSHIP IS MR. RYAN TREVASKIS. Mr. Ryan Trevaskis has worked for fourteen years in the rail industry, starting in 2001 as a High Voltage Substation Technician, working his way up to becoming the SCADA Control And Indications Officer for Metro Trains Melbourne. Ryan currently holds several qualifications relating to his field of expertise including an Advanced Diploma in Industrial Data Communication, Network and IT, a Diploma in Electrical Power Systems (ESI -testing), and Cert IV & III Systems Electrician ESI. Mr. Trevaskis plans to use the RTSA scholarship to assist him to meet the costs associated with his pursuit of a Masters Degree in Railway Systems Engineering at the University of Birmingham. Mr. Trevaskis hopes to advance his career in Railway Power Control Systems by integrating his technical learning from the Railway Systems Engineering degree to facilitate an improved rail network for Melbourne and Australia into the future. 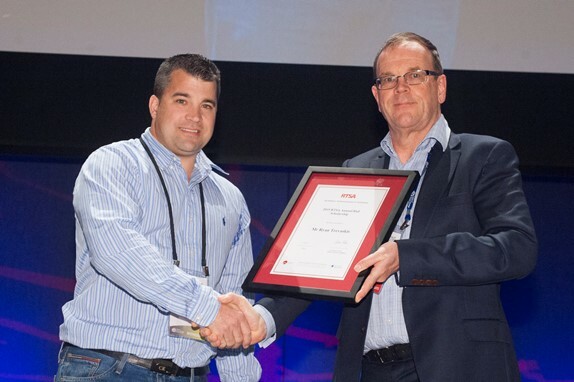 Ryan Trevaskis accepting the 2015 RTSA Rail Scholarship Award from the Awards Sub-Committee Chair Simon Wood at CORE 2016.